Jalandhar: Bollywood’s ace Film-Maker Mahesh Bhatt reached Lovely Professional University, today, and interacted with LPU Journalism & Film Production Students. Occasion was presentation of play “Baat Niklegi Toh” at LPU stage by Indian films top director, producer & screen writer- Mahesh Bhatt. The happy-ending play carried the deep messages for and against reservation, liberalization, communal riots and faithfulness. Actors of the play Imran Zahid, Chetna Dhayani & Chitra Raje Singh enacted well the tale of hardship, strife, faith and love, as depicted in the play. As per the staging of the play “Baat Niklegi Toh” was set somewhere in the time slab of 1990s. 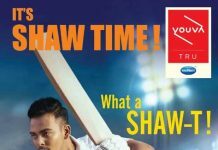 Directed by Viren Basoya and written by Dinesh Gautam, the story of the play is set in Delhi when India was facing serious social issues including caste based reservation, political conflict, communal violence, remarkable fraud cases and more. The hero of the play Ajay Mishra (Imran Zahid), who belongs to a family with immense hardships in a small village of Bihar State, comes to Delhi to be an IAS Officer to eradicate such issues. Confronted with socio-political issues and his hard efforts to succeed, Ajay faces lot of hurdles. However, the play ends on happy notes when embraces success and also gets his love back. 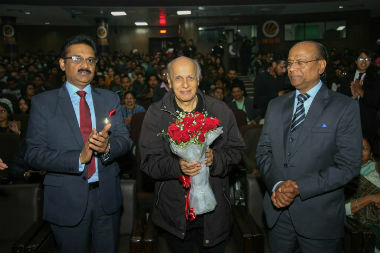 Prior to this, welcoming the top bollywood personality at the campus, LPU Chancellor Ashok Mittal said: “It is a matter of pride for us all at LPU that great bollywood personalities like Mahesh Bhatt Jee and other top actors of the theatre world have preferred LPU for staging of their much applauded play. It will indeed make students think on big lines.” Director Viren, writer Dinesh, Actors Imran, Chetna and Chitra also interacted with the students and shared with them technicalities of the theatre-world. Being in full rhythm of the play and quite away from any religious taboos, Dinesh Gautam wished the students on the occasion of Hindu festival ‘Basant Panchami’ and even recited Sanskrit Shlokas to worship Goddess of Wisdom- Maa Saraswati.